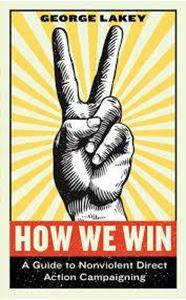 A lifetime of activist experience informs this playbook for building and conducting nonviolent direct action campaigns—teaching us how to achieve real progressive change. A lifetime of activist experience informs this playbook for building and conducting nonviolent direct action campaigns—teaching us how to achieve real progressive change. Today’s new direct action campaigns require a new, down-to-earth guide to effective campaigning. George Lakey’s How We Win is that timely guide. The Women’s March of January 21, 2017, was estimated at four million people - the largest assembly of activist protest in U.S. history. Many of those assembled were in the streets for the first time, or returning after a period of inactivity. Lakey, a lifelong activist, helps us understand our political moment (extreme polarization, ripe for political change), teaches us how to plan a campaign to overcome that polarization, demonstrates how to launch these ideas into action, and shows us how to grow and sustain our movements. This is what democracy looks like. Many years ago, John Lewis and other student activists drew inspiration from the 1958 comic book "Martin Luther King and the Montgomery Story." Now, his own comics bring those days to life for a new audience. In this moving and honest memoir, Peggy details the experiences and challenges of raising both a gay son and a gay, transgender son and shares her family's journey of adversity and growth, which has helped inform her work as a psychotherapist.